You may want to investigate acne light therapy if you're suffering with stubborn break outs that aren't getting clear with traditional acne treatment. Acne laser skin treatments and light therapies are fairly new technologies that are growing in popularity. Recently approved by the FDA for treatment of mild inflammatory papules and pustules, acne light therapy is an all natural acne treatment that has proven beneficial for some people who aren't able to stay clear using prescription medications or over the counter acne treatments. Studies conducted by NASA have shown that cells in our body convert certain wave-lengths of light into energy. The energy produced by these light waves can cause beneficial changes in our skin. Acne light treatments are now being used by dermatologists and skin care centers to kill acne bacteria, reduce inflammation, and stimulate skin repair. Light therapy has proven to be helpful for treating acne as well as signs of aging. When your skin is treated with specific waves of blue light, acne bacteria in your pores release natural organic compounds called porphyrins. The porphyrins actually kill acne bacteria as they release oxygen into your pores, because acne bacteria can't survive in an oxygen-rich environment. So, can you just insert a blue light bulb into a lamp & sit next to it? 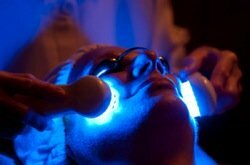 The blue light used to treat acne is created by super luminous LED's (Light Emitting Diodes). The LED's produce blue light in a range of 405 - 420 nanometers, which is perfect for killing acne bacteria and stimulating skin repair without damaging the skin. The blue light produced by LED's is completely different than Ultra Violet light produced by sun lamps, tanning beds, and natural sunlight -- don't confuse the two. Years ago, UV light was used to treat acne -- but, while sunlight may seem to dry out active break outs, it isn't an effective way to treat problem skin. In fact, the harmful effects of UV light far outweigh any benefits you might seem to get for your acne. LED light therapy does not produce heat -- it is anti-bacterial, stimulates skin renewal, and is pain-free. Are Light Treatments Right For Me? Acne light or LED light therapy works best when used in addition to topical products and professional acne skin treatment. It won't work alone because acne is not just a bacterial problem. Learn more about the causes of acne. Light therapy is not effective for non-inflamed acne, such as blackheads and whiteheads. Learn more about the different types of acne. Results are unpredictable. Laser and light therapies don't work for everyone, and there's no way to tell if your skin will respond. To achieve acne clearing, you need a series of treatments. Results will be temporary, and you'll need to continue treatment to receive the full benefits of LED light therapy. Don't expect 100% clearing. Most people that respond to acne light therapy report up to about 60% clearing after a series of treatments. What Are The Benefits Of Acne Light Therapy? The primary benefit is that you'll have fewer pimples. It works best on those annoying inflamed breakouts (papules and pustules) that seem to pop up around your menstrual cycle (for women), or when you're stressed. Light therapy is comfortable, easy to use, and won't cause negative side effects like prescription medications and harsh skin treatments. Your skin will look and feel better with each use, and you don't have to worry about redness, irritation, or peeling skin. If you're getting professional acne skin treatments, ask your skin care expert if light therapy would be helpful. LED light therapy can be added on to most acne treatments for an additional charge. Acne light therapy works best when used daily, so the most effective way to add it into your routine is to purchase a device you can use at home. This will be more cost effective than having professional LED treatments as well. Because most of us don't have time to sit in front of an LED light source every day, I recommend you find a hand held unit. This way you can treat your skin while doing homework, watching TV, or while you're online. Using a hand held device will make it easier for you to make light therapy part of your daily lifestyle. Light therapy home devices are simple to use and there are no negative side effects when used correctly. Simply hold the device to your skin wherever you tend to break out -- even if you don't currently have pimples in that area. Each acne prone area can be treated for up to 5 minutes, and for best results skin should be treated daily. Remember, acne light therapy works best as an addition to an effective acne skin care routine. Consult with an expert to make sure you're using the right products for your skin before investing in any type of acne light device.